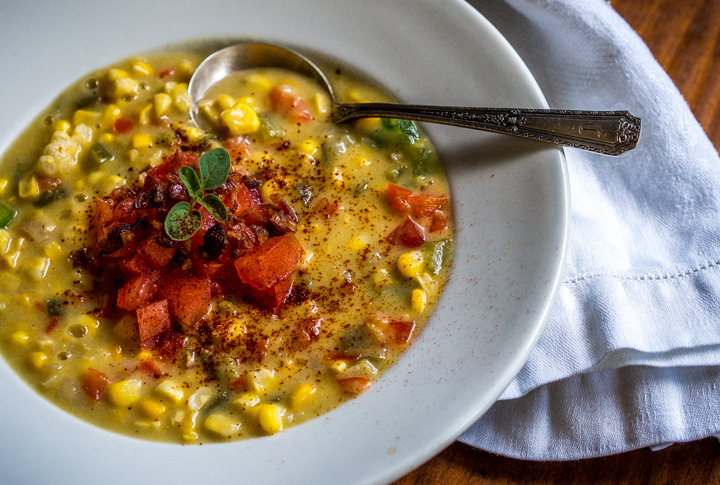 Maque Choux is the traditional south Louisiana dish that lets you eat your way through all the corn, bell peppers, and tomatoes that summer generously provides. Sauteed in a little bacon fat and cooked down in chicken broth it’s a side dish that even the vegetable phobic will like. In short, if your backyard vegetable garden looks like the Little Shop of Horrors this will give you an incentive to harvest and cook. My original thought was to post the traditional recipe minus the weirder modern accretions like toasted sesame oil, heavy cream and jalapenos. Ideally be prepared with ingredients already in your garden or kitchen. 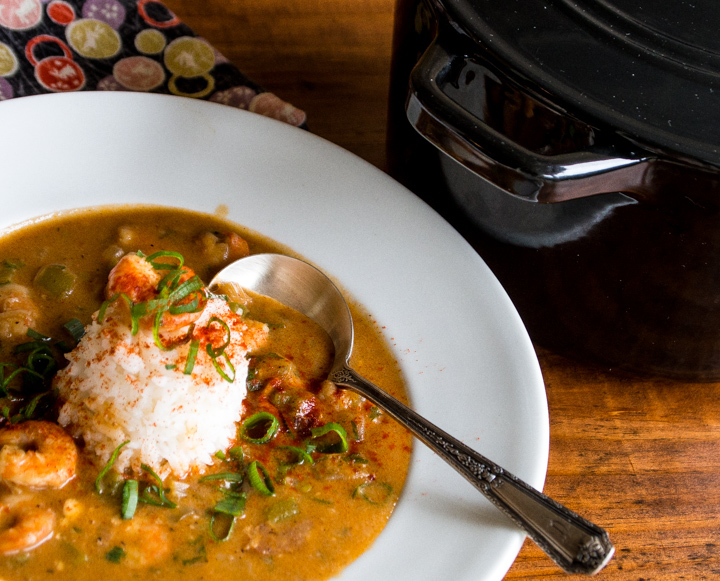 Once you’ve picked or bought them it’s time to start making the Soup Maque Choux. The idea for transforming it into a soup came to mind in mid prep and it turned out to be a good one. I went for a light base (no heavy cream) but with plenty of veg to make it filling. To start you need to roast the corn which I did in the oven. 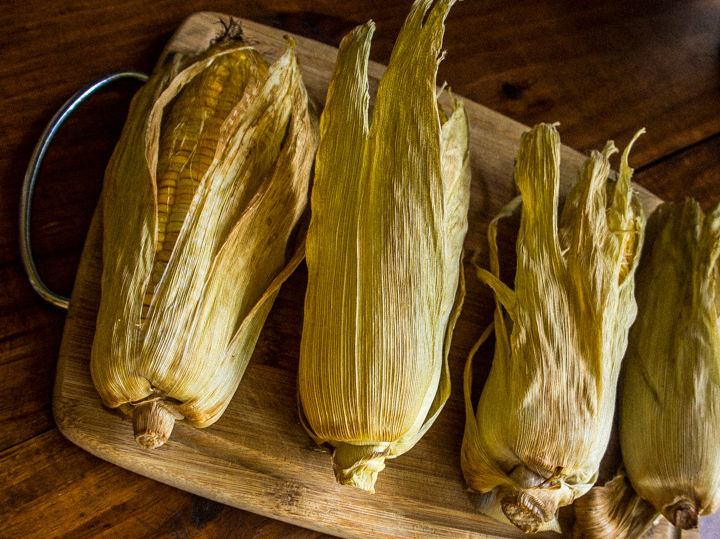 Just rinse or soak the unshucked cobs for a minute and lay them directly on the rack in a medium oven. 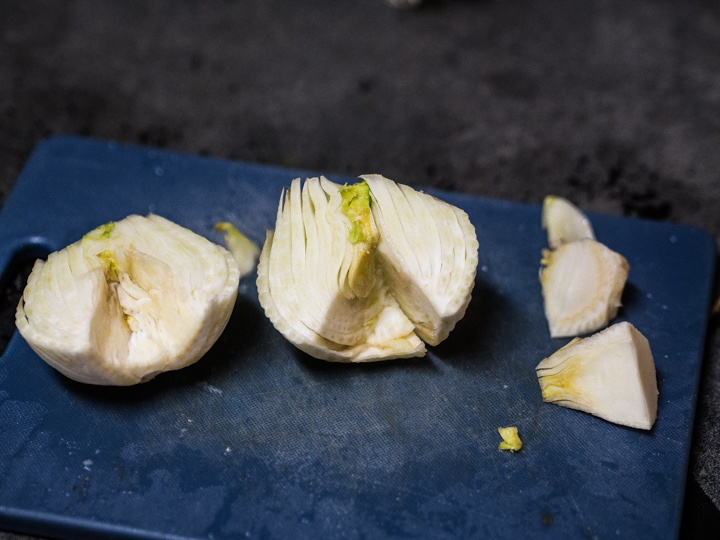 No need to wrap in foil, the damp shuck will provide enough cover to steam. If anyone nearby has the bbq pit fired up you could throw the cobs on for some extra flavor. After about 30 minutes they’ll come out looking like this after which you’ll cut the kernels off and transfer to a bowl. 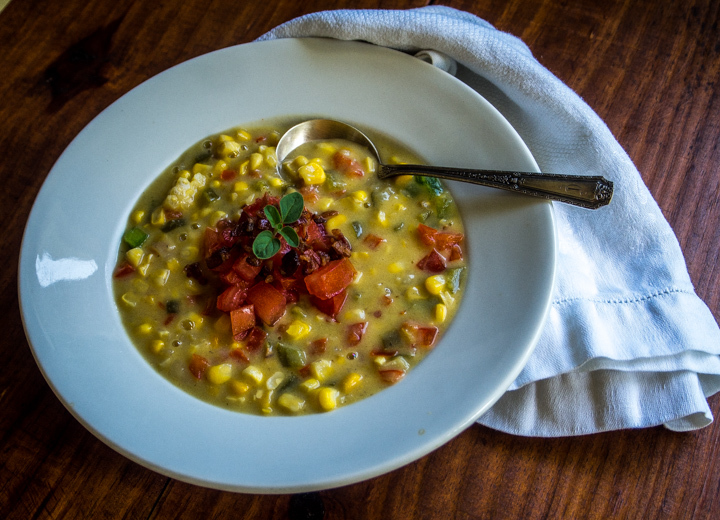 While the corn is roasting (wherever it is roasting), throw the bacon in a big soup pot and cook until brown. Remove & set aside. Then add the butter and throw in all the veg you’ve chopped (except for the tomato) and saute for over medium heat for five minutes or so. Next add the flour and stir in well. When that’s done gradually add half the chicken broth and half the corn kernels. Stir to incorporate and then for the last step dump the remaining chicken broth into a blender with the rest of the corn. Puree the hell out of it and put a strainer over the pot and pour. Press down and try to extract as much corn goodness as you can out of the broth before you toss the remains. Add the seasonings, stir well and cover. You should let it bubble over low heat for at least twenty minutes but it can go for longer. To serve ladle it into the bowl and mound the fresh chopped tomato in the middle with the crispy bacon on top. Anoint with paprika or cayenne or both and be sure and position your head directly above the bowl as there will be drips as you slurp your way to the bottom. Soak the partially shucked corn in water and place in a 350 oven for 20 minutes. While the corn is cooking cut the bacon into small pieces, place in a pot over medium heat and fry until brown. 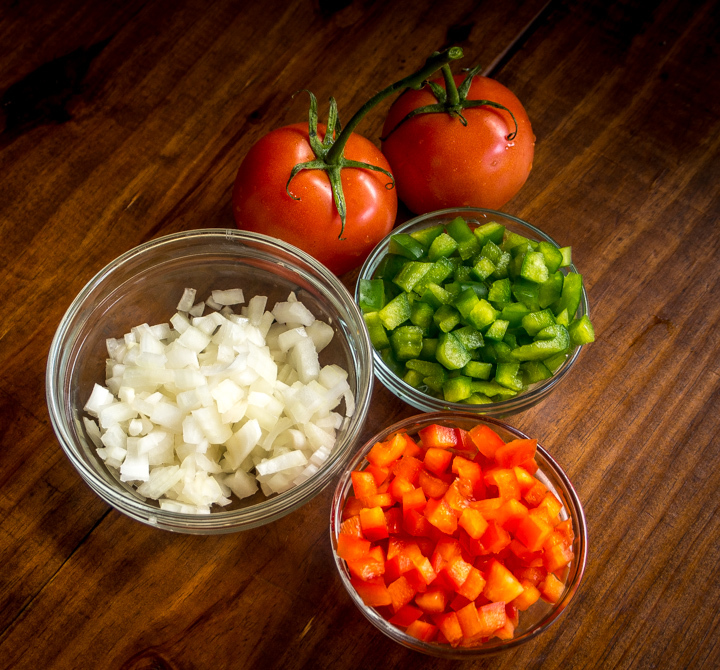 Remove bacon with a slotted spoon and add butter then stir in onion and bell pepper. Add flour & cook for a minute then gradually add chicken broth. When the corn is cooked cut the kernels off of 2 ears. Put one can (2 cups) of chicken broth into a blender, add the corn and puree. Put a strainer over the soup pot and add. Discard the contents of the strainer. 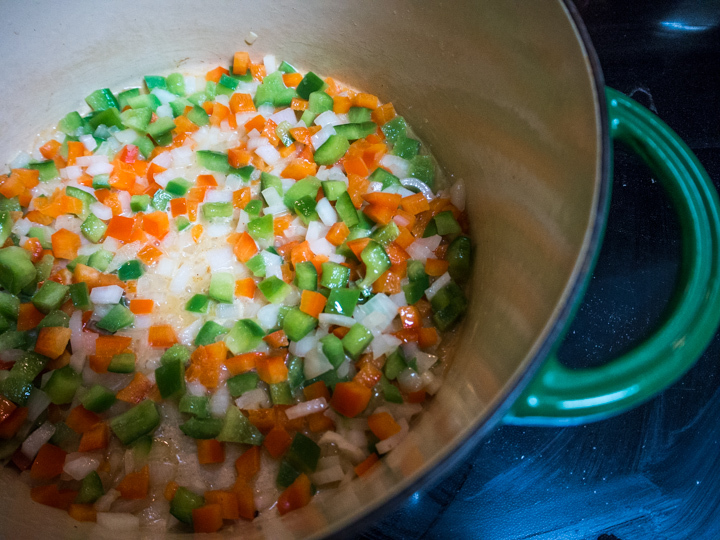 Add the remaining two cups of broth and cut corn, season to taste, cover and let simmer on low for 20 to 30 minutes. Garnish with diced tomato and serve. If you have some bird's eye peppers feel free to slice one and drop in the pot. 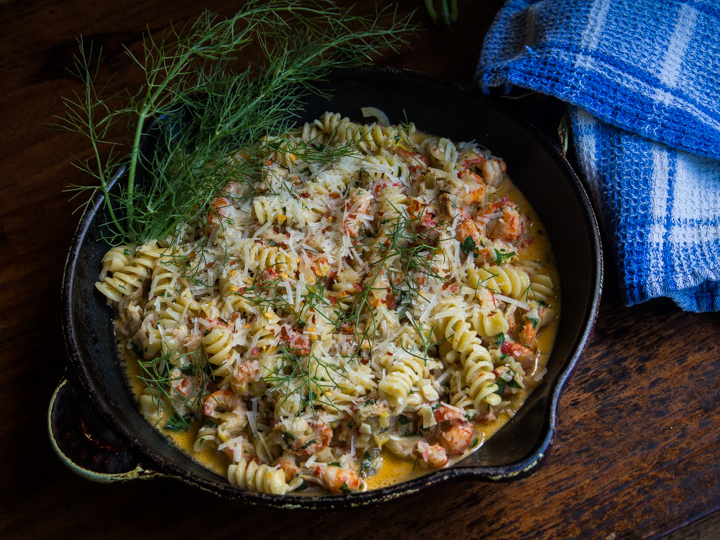 Ask anyone from Caddo parish to name their favorite local spot for home cooking and you’ll likely get a short list headed up by Herby K’s. Herby’s was founded by Herbert Busi and he had a feel for branding that would do a hip hop producer proud. He gave the restaurant his nickname, Herby K, and the best joint in Shreveport was born. Shrimp Busters soon followed. 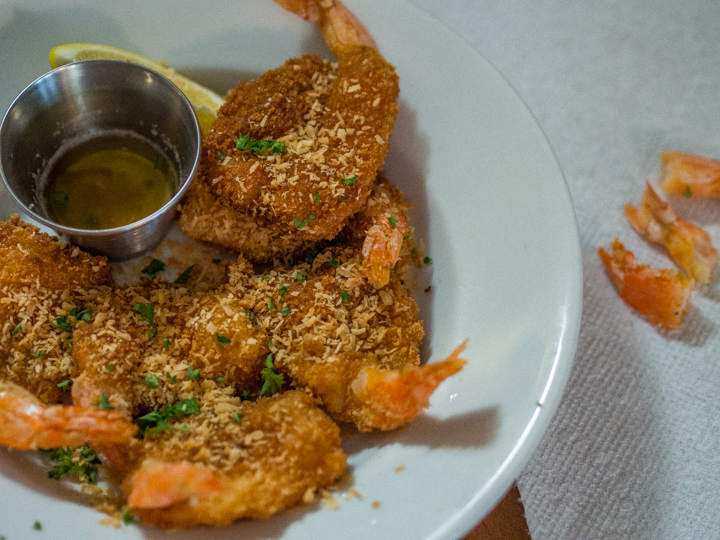 The Shrimp Buster marries Louisiana frying skills and South Pacific style butterflied shrimp in an early version of fusion cooking that is still packin’ em in on Pierre Avenue in Shreveport. 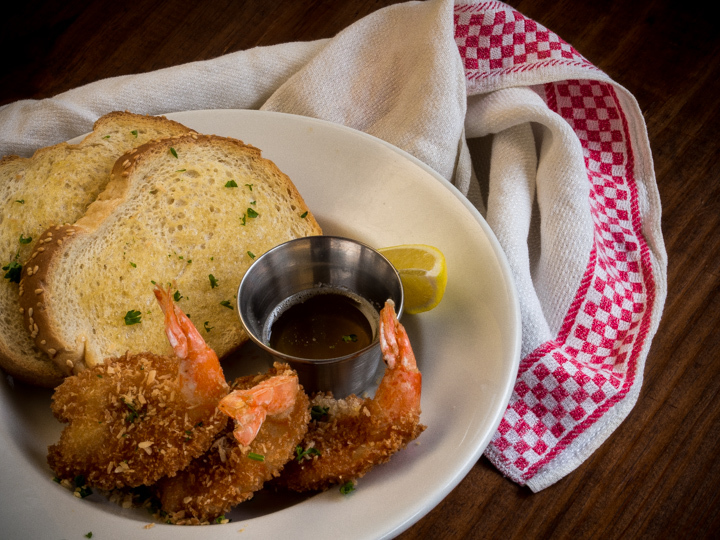 It began after the Civil War when Cesare Luchini moved to Louisiana from Italy and started a construction company that later built a restaurant serving the nearby railroad workers on the Kansas City Southern’s Flying Crow. That was 1936. By 1946 soldiers returning from the war were requesting a local version of the butterflied shrimp they’d come to enjoy in the South Pacific and Herby K’s was quick to comply. 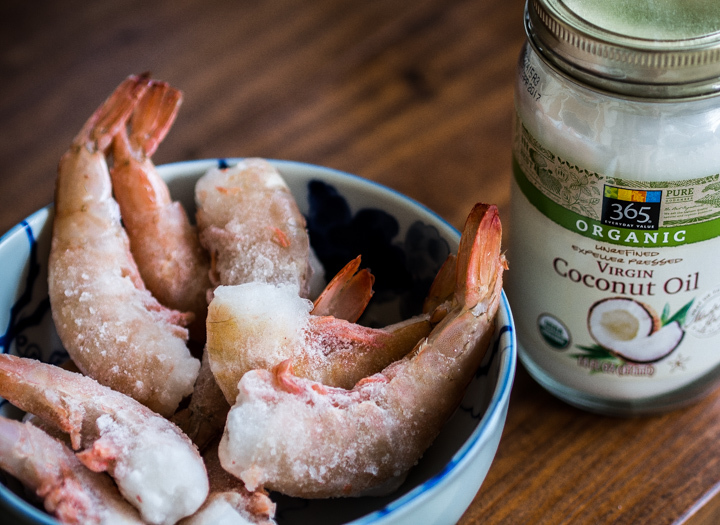 My version is cooked in coconut oil which imparts a subtle flavor and is not at all greasy. It’s probably too expensive to do commercially at a price point that’s viable for a local diner trying to keep it real, but you can make it at home. 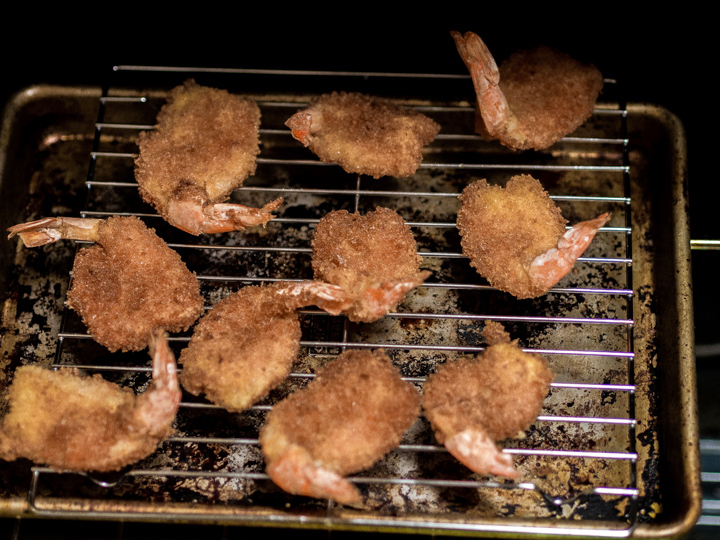 I shallow fry the shrimp in batches and drain them on paper towels or grocery bags then transfer to a wire cooling rack and put in the oven while the rest are cooking. This keeps them dry and crispy. Herby’s has their own sauce but I came up with a butter based alternative. 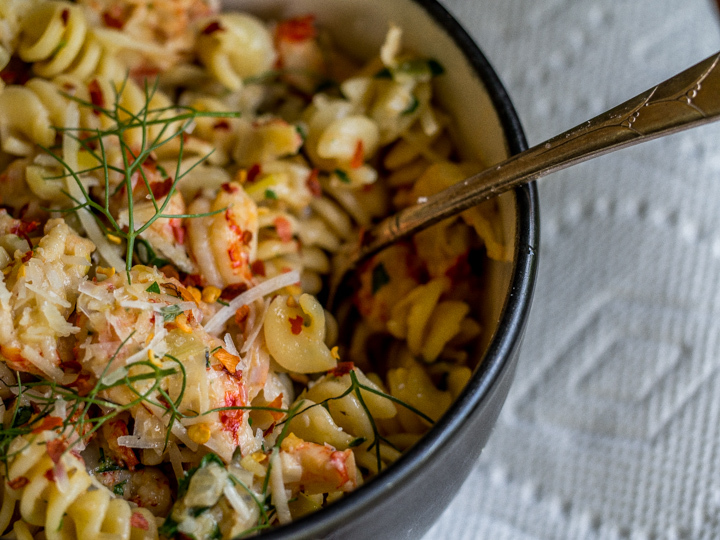 It’s made with clarified butter, crushed garlic and lemon zest to taste. I remove the garlic before serving so there are none of those undercooked chunks of raw garlic to bite down on and make you unkissable for the next twenty four hours. It can also be swabbed onto the toast as well as being used for dipping. I included my version of a catsup based sauce below for those who prefer it. To prepare the shrimp peel down to the tail leaving one section of shell attached. This will anchor the tail and keep it attached while frying. Next dry them off well. Then take a meat pounder or even a coke bottle, oil the bottom and hit it lightly just enough to flatten it a bit. 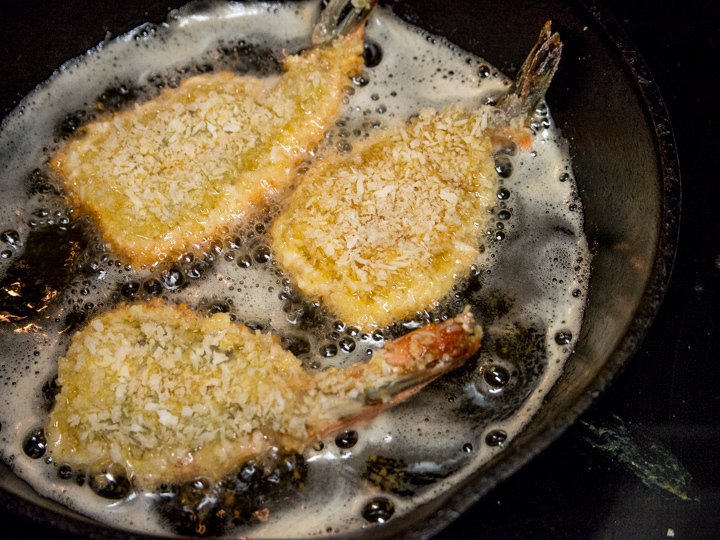 Then season to taste, dredge in rice flour, dip in the egg, and finally in the Panko/coconut breading mix. (I sometimes save a little of the shredded coconut for sprinkling on top. If you do that you can either leave it raw or toast it as I did.) Let it set for a few minutes then drop into about an inch of 350 degree oil and fry until brown on both sides. They cook fast so stick around. Try to push the tail into the hot fat while it’s cooking. If it’s crispy you can eat it too. To maintain my rigorous commitment to testing each and every batch of busters I powered my way thru about a pound before sharing the rest. They were all good and so was the extra toasted coconut on top. In the unlikely event that there are shrimp survivors you may freeze them in foil and warm in the oven. They will still taste pretty good. Prepare three containers or plates. The first with rice flour, the second with beaten eggs, and the third with Panko/coconut breading. Peel shrimp leaving the tail attached and dry off. 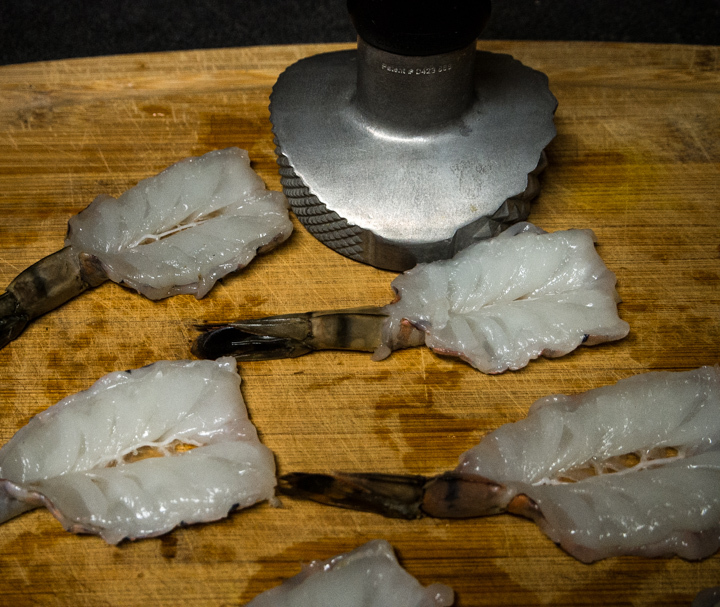 Cut the shrimp down the back till you can lay them out almost flat & blot dry with a paper towel. Gently flatten with the bottom of an oiled meat tenderizer or glass jar. Dip in flour, then egg, then breading. Put about an inch of oil in a pan and heat to 350. 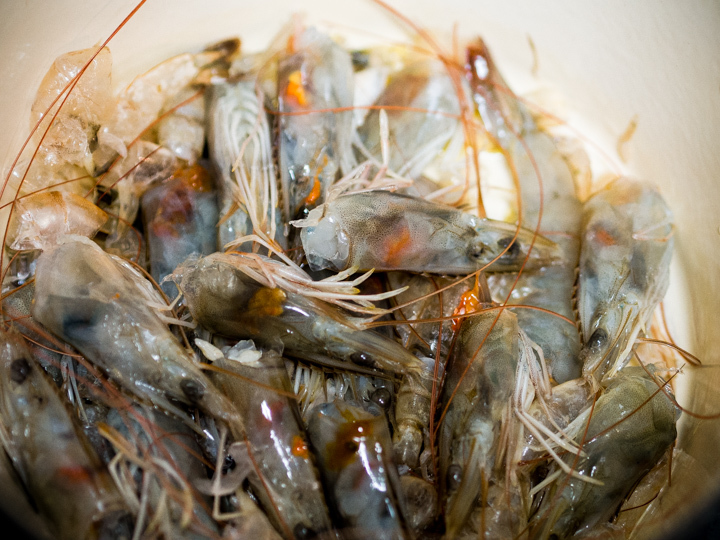 Once oil is hot add shrimp. Fry till brown on both sides about 1 minute per side. Melt butter & skim off the white solids that rise to the top. 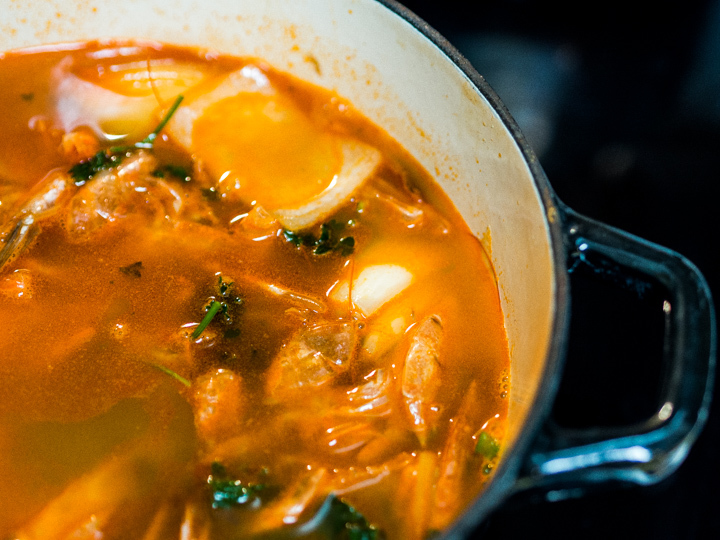 Add the crushed garlic and let simmer over an extremely low heat for 10 minutes. Grate lemon rind over sauce. Rice flour is called for because it fries up crispier, but if you don't have it you may used cake flour or all purpose flour.